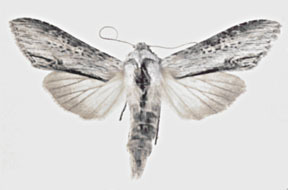 Cucullia similaris Smith, 1892, Proc. U. S. Natl. Mus., 15:41, pl. 2, fig. 3. Diagnosis: Cucullia similaris is a species of the Great Basin region occurring in drier locations at moderately high elevations. 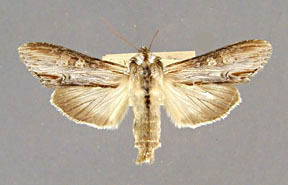 The forewing of similaris is characterized by a medium gray coloration suffused with light gray, the absence of a brown tint as in montanae, and distinct light rings around the orbicular and reniform marks. This species is sympatric with obscurior and montanae, but its distribution is more restricted than either of those two species. Superficially similaris strongly resembles obscurior where the two species are sympatric. 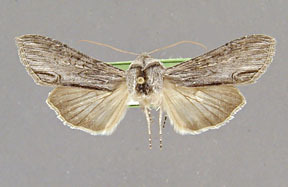 The forewing of similaris, however, is strongly marked with light gray and the reniform and orbicular marks are each clearly marked with a light ring. Sympatric populations of obscurior, in contrast, are uniformly dark gray and the reniform and orbicular marks are obscure. 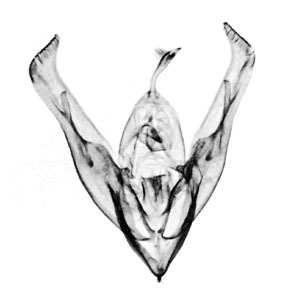 The diverticulum bearing the single large spine in the vesica of the male genitalia is double, as it is in the florea complex of species. There is no small, second spine or associated small diverticulum as in montanae. 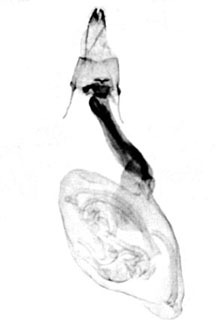 There is a small, lateral diverticulum near the junction of the ductus seminalis. Wing length from base to apex: mean = 21.87 mm., standard deviation = 0.88 mm., n = 10. 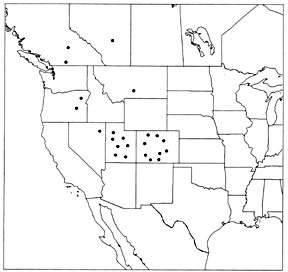 Distribution: This species is commonest in Utah, middle to western Colorado, and eastern Nevada. Specimens from British Columbia, Alberta, Montana, and Oregon have also been seen. Adults have been collected from late June through August.